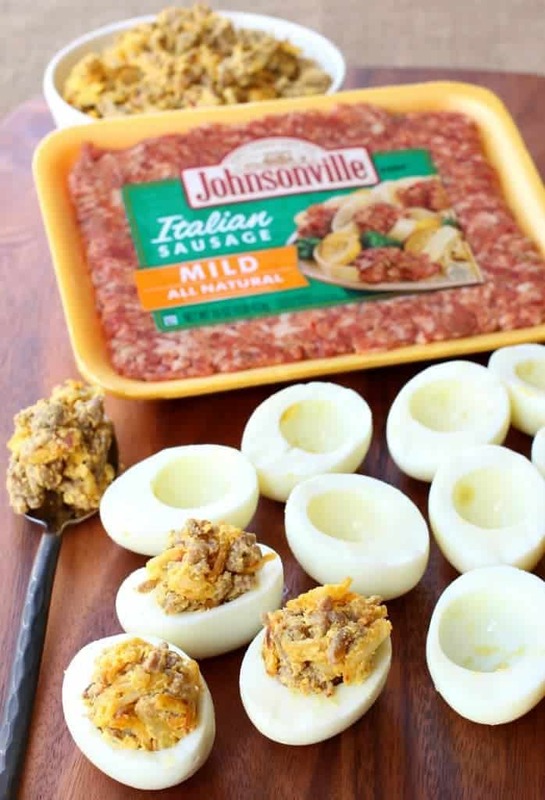 These Sausage and Hash Brown Deviled Eggs are insanely delicious appetizers! 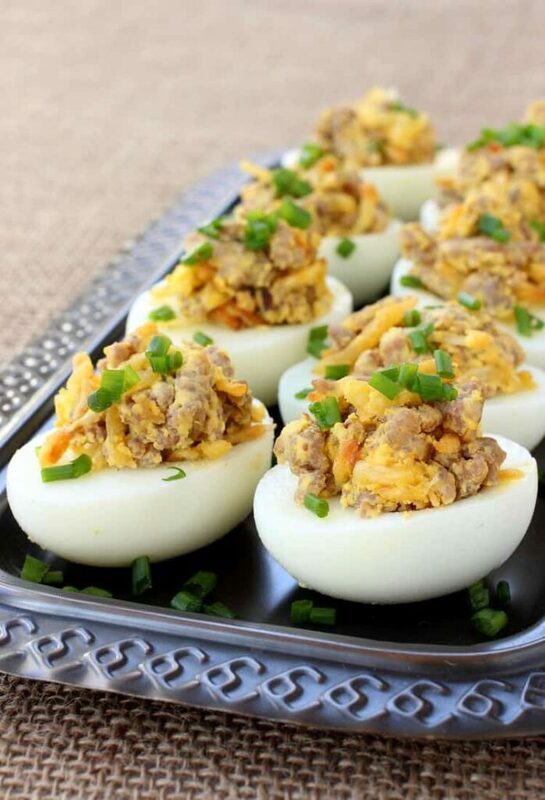 These deviled eggs have all your favorite breakfast flavors in one handy bite! Got eggs? 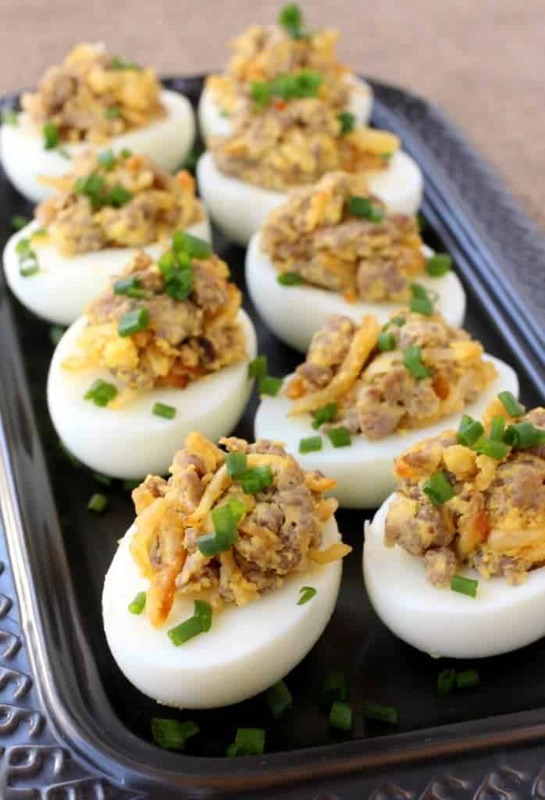 Try this Classic Deviled Egg Recipe or these fun Buffalo Chicken Stuffed Eggs! Or if you prefer your eggs scrambled, try our Taylor Ham & Cheese Breakfast Casserole! Yes these stuffed eggs are epic appetizers, but don’t just save them for that! 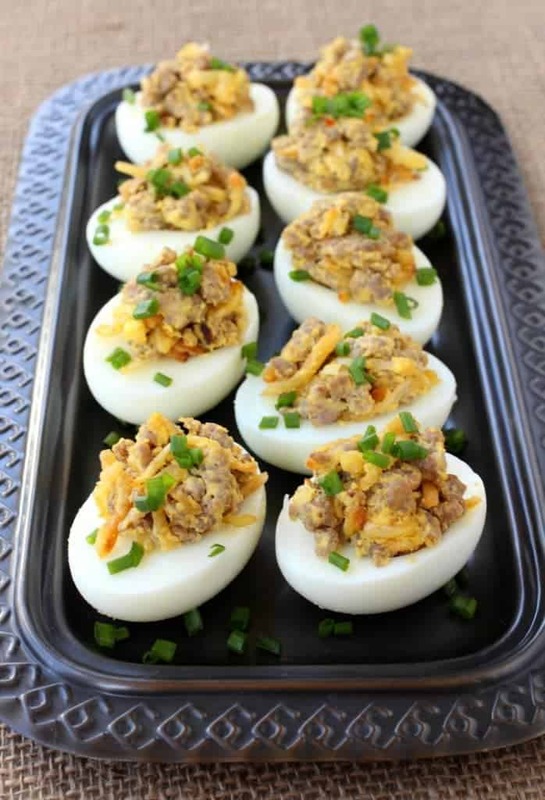 These Sausage and Hash Brown Deviled Eggs are also great for breakfast, lunchboxes, after school snacks or even a light dinner! Appetizers are were I like to shine. Sure the classic cheese boards are a staple, I don’t think we ever have a party without one! 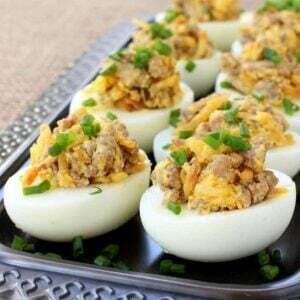 But putting out a few fun, creative appetizers like these deviled eggs are what really impress your guests. 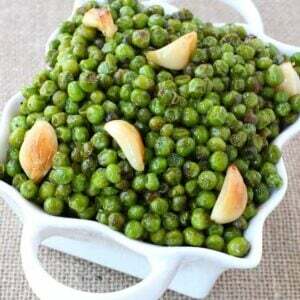 Especially when you’ve got an easy, make ahead appetizer recipe like this one. Anything you can get done ahead of time when it comes to party planning is at the top of my list. Start by making the filling for your eggs. Brown the sausage in a large skillet then drain any grease and remove to a bowl. Don’t wipe anything out of the skillet!!! I know some of you like to do that but you’re going to leave all that good stuff right in the pan. We’re going to use that leftover fat to brown the hash browns next…. After the hash browns are cooked, add them to the bowl with the sausage along with the egg yolks and just a few other ingredients. 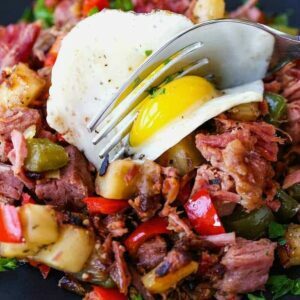 Mix together and get your eggs ready for stuffing! 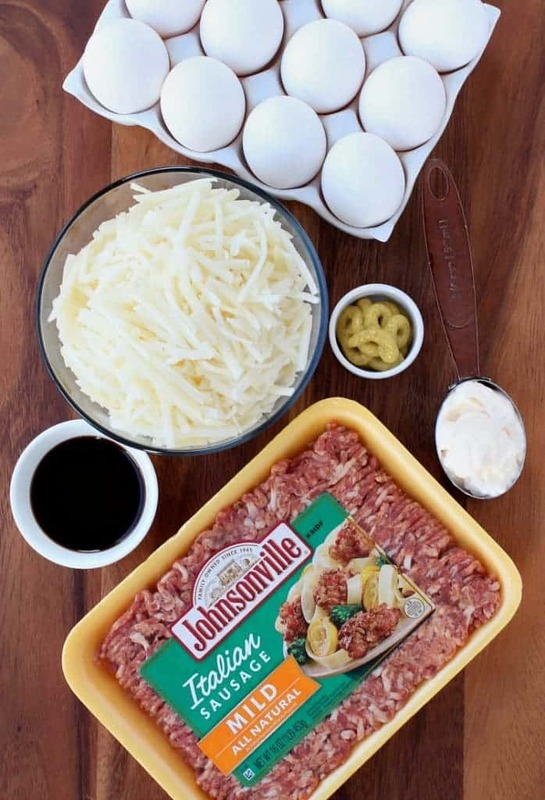 Fill each egg half with the sausage and potato filling and place onto a platter or board for serving. Can You Make These Deviled Eggs Ahead Of Time? You can definitely make these appetizers ahead of time, which as I said is a key to entertaining. The eggs and the filling can easily be made up to two days ahead of time, but if you’re going to stuff the eggs I would only do that a few hours ahead of time. Still you can have everything ready to go, then stuff the eggs, cover them in plastic wrap and get them in your refrigerator. All you need to do at party time is garnish with some chives and possibly a drizzle of sriracha if you like a little heat! As you can see, we like to really stuff these eggs to the maximum capacity. I mean it’s all about the filling here, am I right? This deviled egg recipe uses a full dozen eggs, making 24 appetizers out of the halves. Or double the filling if you went a little Easter egg coloring crazy! PRO TIP: Try this the Dash Rapid Egg Cooker for the easiest, most perfect hard boiled eggs! The shell literally comes right off! 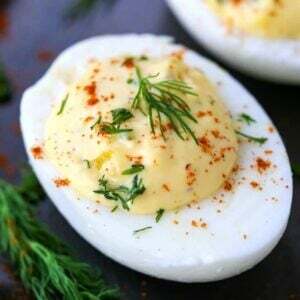 This kicked up deviled egg recipe are the perfect appetizer for brunch, holidays or any party! Start by heating a large skillet over medium heat to brown the sausage. Break the sausage up into small pieces as it cooks, cooking until all the pink is gone. Drain and remove the sausage to a bowl to cool. To the same skillet, add the hash browns and cook until crispy and brown, about 10 minutes. Add the hash browns in the same bowl with the sausage to cool. Once the filling has cooled, add the mayonnaise, Worcestershire sauce, mustard and half the reserved yolks from the hard boiled eggs. Stuff the eggs with the filling and garnish with chives. This is creative! Bite size snacks are great on game day.